For me, 2015 was my seventeenth year in a row — first as a concerned citizen/volunteer wanting to help change a very bad law, and for the last ten years as an organizer and a vendor. Cannabis Day had become a mainstream event complete with entertainment and many potent speakers during the day. But most importantly it included a vibrant farmers’ market, with over a hundred vendors selling all things cannabis in defiance of the law forbidding it. It is the law against selling cannabis that is so destructive to our society; denying access to such a wonderful life-saving medicine. That’s why we feel it’s important to openly break that law. There was nothing else like it in the world. Year after year, since 2005 the vending of cannabis from tables and booths at both the 4/20 protestival and on Cannabis Day had gotten bigger and bigger, without any interference from the police or public officials. That is, up until 2015. The incredible growth and popularity of “Cannabis Day” during the decade leading up through 2014 — along with the great job that was done during the events to expose the harms and the hypocrisy of prohibition — were designed to be very embarrassing to the government. And it was apparently successful, which was made obvious by the attempt to shut down the event in 2015. Then a letter was sent by the City to Jodie Emery and Cannabis Culture just two weeks before July 1st, demanding that they cancel the event. Cannabis Culture Headquarters was the originator of the event and had organized it from the beginning, but could not and would not attempt to stop people from gathering at the Vancouver Art Gallery. After a somewhat hostile negotiation, it was agreed that the event could take place on the south side of the gallery, the City said the north side would be under construction and not available. But no stage could be erected and no vending spots could be sold; so the money was returned to the vendors and we decided we could use the stairs as a stage. The morning of July 1st, 2015 was unlike any Cannabis Day before it: we arrived at 6:00 am to find several groups of unfamiliar police officers getting right up in the faces of anyone who tried to drop off or set up anything. There were none of the usual group of familiar and friendly police officers who had been doing our protests for years. There was a cop on a motorcycle that swooped down on anyone who pulled to the side of the street to unload; several tickets were issued. There was a VPD video crew with a camera on a stick getting video of everyone there. And all of the officers were unfriendly and trying to be intimidating. They were standing in groups front and centre; most of them wearing sunglasses and crossing their arms. The vibe was very tense as more and more people arrived to find out the VPD were not going to let anyone set up. Eventually one of the people who had hauled in a tent on foot quickly set it up, only to be set upon by a group of VPD and city engineers who instructed her to take it down. When on my suggestion she stopped taking it down the VPD instructed an engineer to do it. But as he reached for it, I stepped up and informed him that this was a campaign site for a federal political party, of which I was an officer. And that our activities were protected by the Elections Act, which supersedes any city by-laws, so if he was to continue he would be subject to a large fine. He then backed off and huddled with the VPD, who were on their headsets. After a few minutes they walked away, at which point several more tents were erected. But no one was willing to vend with the police so close and so menacing. Who would want to vend while these officers “Serve and Protect” them? It wasn’t long after the tents went up that I spotted a senior VPD officer and I went to speak with him. We discussed the fact that there would be thousands of people attending and that there would be lots of cannabis consumed and sold. And that there was no need for the police presence: no one was going to be harmed and many people were feeling very anxious about the behaviour and body language of the police onsite. I suggested that many of the officers should be sent away as our events had always been peaceful. He said he understood and agreed, and that they would be reasonable. I believed him and that was a mistake. Armed with my misplaced belief, I proceeded to take out my jars and begin vending. I immediately had a line up of eager people who had been waiting for someone to help them. And for about ten minutes I did just that. The issue was that the police did not go away, in fact they seemed to be closing in on me. So I stopped what I was doing and put my jars away. Right at that time I was summoned over to the VPD video crew officer, Brandon Steele, who told me that if I continued I would be arrested. I responded with defiance, declaring that it would be a big mistake for the VPD to do that and that we were going to continue to sell cannabis and break that bad law because we are good people and good people have an obligation to break bad laws. And that we had been doing just that on this day, at this place, for over a decade. I told him that if he was a good Canadian he would stand down and walk away. The key word in my declaration to him was “we”; I told him we were going to continue, for my part I just went over and sat with a friend on a grassy knoll. I watched as several VPD were staring me down, they would not take their eyes off me. On two occasions over the next ten minutes or so I stood up and demanded that the VPD stand down and leave, stating that they were causing serious anxiety and could even be accused of attempting to incite a riot. There was no movement by them, they just continued to stare me down. So I decided to get up and go for a walk to see what would happen. I just started to get to my feet when over a dozen VPD officers ran up to me and tried to arrest me. Too many scrums and scuffles, arrests and attacks happened from one peaceful protest. For all my years of being involved with 4/20, the Global Marijuana March, Cannabis Day, and all of our other protests we had preached about “hug power”. Hug power was David Malmo-Levine’s idea to un-arrest peaceful cannabis activists whom the police try to arrest. The idea is that nearby people “hug” the potential arrestee tight and don’t let go, without touching the police. Other people yell at the police that there is no harm being done and the law is wrong, while other people stay back and get video. We had not had to use “hug power” until that day, it was clear that the VPD had been listening and had trained for it. With the police trying to arrest me with many people hugging me tight, it was on. 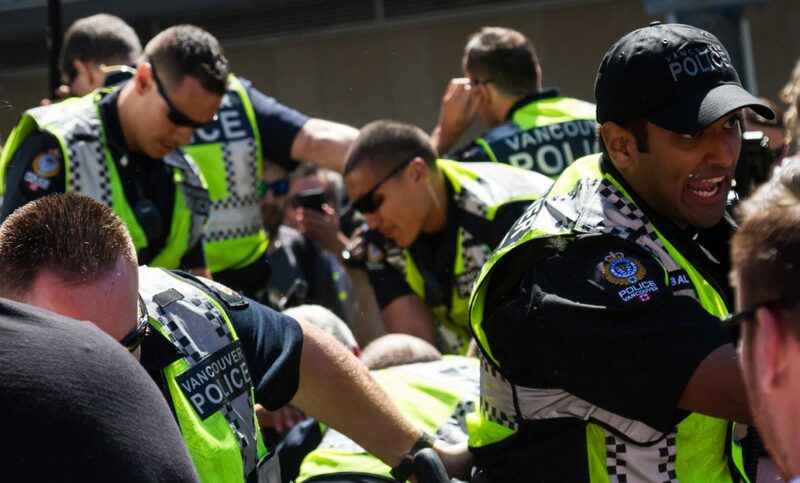 The first wave of VPD were quickly joined by over a dozen more who surrounded the scrum and kept others away with pepper spray, while others were also being assaulted by VPD members in the process. It was mayhem both inside and outside the scrum. For my part, I was at the bottom of the pile and feeling helpless. At one point a VPD member was trying to break my arm by twisting it as hard as he could. I looked up at him and asked him why he was doing that as I was not even resisting. Thankfully he then let go. At another point my windpipe was depressed and I thought I was going to die because I could not breath or get out a sound. At the last moment the pressure was removed and I got air. I also felt like I was going to be ripped apart as the VPD were yanking on my arms while my friends hung onto my leather belt. Eventually the VPD got me extracted and into a paddy wagon, along with four others, and took us to the police station under arrest. Arrested for cannabis. And now former officers are joining cannabis businesses. The ride in the paddy wagon was interesting as I managed to get out of my handcuffs. I still had my side-bag and my phone, so we smoked joints in the back of the paddy wagon while posting pics to Facebook. I was charged with trafficking and the other four were charged with obstruction. Meanwhile back at the Art Gallery the police were under siege by hundreds of angry protesters who loudly shamed them and corralled them up against the building on the east side of Howe Street. There they managed to skulk away with their heads hung and their tails between their legs. Protesters after being tear-gassed. Because women in bikinis are incredibly dangerous to armed police. It could easily have been so much worse: it was very fortunate for the VPD that they were faced with cannabis users as opposed to alcohol drinkers. With the police now banished, protest continued with vigour and cannabis vending resumed for the rest of the day, with our community shocked and in mourning about the actions of the VPD. A few court appearances later and my four co-accused had the charges dropped. But the court was going to continue to prosecute me even though there was no cannabis or controlled substance seized from me. I had several court appearances where I declared that they had no jurisdiction over me, that the law was wrong, over-broad and arbitrary among other things, but still they continued. In 2016 I accepted the pro bono help of lawyer Robert Laurie. And on it went. It almost went to trial in May of 2017, but Rob had a lung infection so it was delayed until February 2018. But finally in August 2017 they stayed the charge. I know that I should consider this a win, but part of me does not feel that way. I really wanted to expose the City and the VPD for that horrendous, politically motivated, and violent assault on peaceful protesters. They should be ashamed of their actions and should be held accountable. It was abuse of authority, it was a criminal misuse of public funds, and it should never be allowed to happen again. The good news is that after more interference by the VPD in 2016, this year we reclaimed the day with a new location and with even more determination than ever. The VPD assured me personally that there would be no more interference in the future. And now with legalization happening for cannabis in 2018, vindication is ours and the battle is won. …Unless of course it’s fake legalization. In which case the protests will continue. 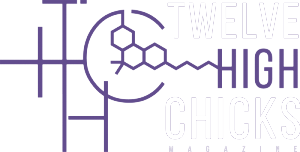 Photography by MaryBeth Lafferty Photography for Twelve High Chicks. Cannabis could have been legalized sooner and there were no problems with cops.